Like it or not, global warming will affect Russia, and ignoring it only stores up problems for later. The future is not what it used to be. Giant methane ‘holes’, intense snowmelt floods, and more extreme weather events – these are just some of the future climate change impacts Roshydromet expects to see in Russia. At the same time, we keep hearing that climate change might actually be good for Russia. There is a view that it will benefit the country through a shorter winter season, better temperatures for growing food, and more accessible oil and gas in the Far North. In fact, the methane ‘holes’ – craters thought to be produced by the release of gas from thawing permafrost i.e. 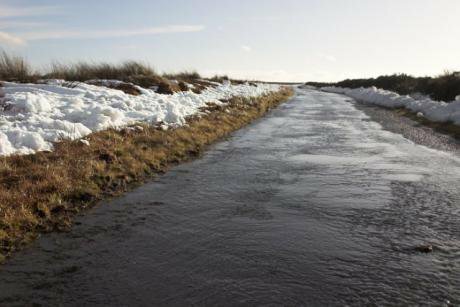 permanently frozen ground – are already a reality in Russia, as are more intense extreme weather events. Both may be linked to global warming. In the longer term, Russia is likely to be affected by climate change impacts more than many other countries, apart from low-lying lands such as Bangladesh and small island states. In particular, temperatures are rising more quickly within the Russian territory than in lower latitudes. This is likely to have a devastating impact on the northern ecosystems that will have nowhere else to go. The methane locked within permafrost may amplify global climate change as this ground starts to thaw. Buildings, pipelines, and other infrastructures built on the permafrost will be in trouble as solid ground turns into bogs. Consequently, even the prospect of access to new oil and gas resources is not so rosy, because of the construction challenges associated with northern conditions and melting permafrost. There is also bad news for the agricultural sector, which is most affected by the climate and weather. Temperatures may be going up, but this does not mean that agriculture will start thriving in new places. Warm temperatures alone are not enough for growing crops and fruit. Fertile soil is needed, and newly warmed regions have much less of this resource than Russia’s current agricultural regions. More volatile weather conditions, and more intense and frequent, extreme weather events, brought by climate change, would also damage yields. 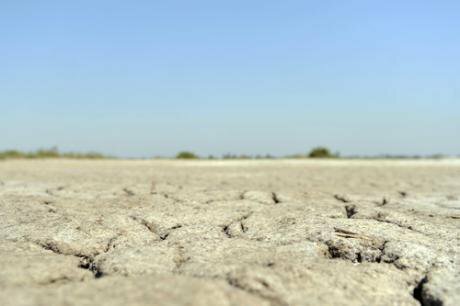 Dry regions are likely to become drier, with wet regions getting still more rain. In addition, some of Russia’s food imports come from countries even more exposed to climate change risks than Russia. For instance, most of Russia’s imported wheat is from Kazakhstan, where climate change is expected to exacerbate droughts. These impacts would make farming harder and food more expensive. The most prominent part of the Russian economy – the energy sector – would likely suffer also. For example, the number of technical breaks on the under-river parts of pipelines is expected to rise, due to more changeable seasonal conditions. This is on top of the problems arising simply from the age, and wear-and-tear of existing infrastructures. In the power sector, for example, increasing sleet on overground electricity transmission lines will lead to more breakdowns. Similarly, more extreme weather events would inflict additional damage on the energy system. The government has taken a few steps towards a lower-carbon future: it has signed up to the global 2°C emissions pledge and adopted the Climate Doctrine and the Renewable Energy Decree. However, Russia’s other policies contradict its climate change commitments, including generous subsidies for the production of fossil fuels. In this sense, the left hand does not want to know what the right hand is doing. This is unfortunate because Russia is awash with affordable opportunities for decarbonisation, which could boost the economy. Exploiting renewables and improving the energy efficiency of buildings, transport, and industry would bring so much more than just a reliable and low-carbon energy system. There are good reasons for the Russian government to take the climate change problem seriously. Clearly, the climate will significantly affect life beyond the energy sector. For example, if Central Asia is to face the water security crises predicted by scientists, then migration from these areas to Russia would increase in response to climatic changes. A growing number of climate refugees would likely worsen the government’s ongoing clampdown on illegal immigrants and further complicate migration policies. Scientists expect changes to the environment in Russia and its neighbours, but what does this mean for society? Is Russia well positioned to handle these issues, or will social problems be more likely if global temperatures continue to rise? The distribution of Russia’s 146 million population across the country has a major influence on its national infrastructure. For example, settlement patterns and transport links determine, to some extent, whether a centralised or distributed energy system is appropriate. Two-thirds of Russia’s population live to the west of the Ural Mountains, that is to say, on just a quarter of the country’s total land mass. The urban population is concentrated in the two federal cities, Moscow and St Petersburg, and there is a large gap between these two cities and the next tier of cities in terms of economic development and connectivity. Importantly, at least a third of Russia’s population lives in cold and very cold cities, which have no analogues in other countries. For comparison, some of Canada’s regions experience average winter temperatures similar to those in Russia; however, more than 95% of Canada’s population is concentrated in the country’s warmest regions close to the border with the US. A long cold season in populated areas highlights the importance of secure and reliable energy supply in Russia. Although many Russians who lived through the 1990s are used to power cuts, such events will disproportionately affect poorer people. With mounting pressures on agriculture, climatic changes both at home and abroad would drive food prices up and, again, mostly affect more vulnerable groups of the population. The rich and well-to-do will certainly find ways to adapt. Such a situation would not only be unfair and unethical in principle, but can also lead to social unrest. This shows that addressing climate change – by both reducing emissions and by adapting to the climatic changes already in motion – is in the interests of both the people and the government. Despite these predictions, people in Russia do not press the government to address the climate change problem, here and now. Why is that? Surveys show that many Russians are aware of climate change as a serious issue, even though this awareness is lower than in some other countries. But are they aware of its long-term consequences? And if their awareness grows, would they do anything? As seems to be common with the majority of people around the world, Russians perhaps have a hard time linking long-term, global dangers to their everyday experiences. There is an issue of inter-generational justice, i.e., balancing our immediate needs against the long-term welfare of our children and grandchildren. When immediate needs dominate, economists call it ‘discounting the future’. There are many explanations for this in relation to climate change. For instance, because the impacts of climate change will be more severe in the long term (by 2050 and beyond), people do not feel threatened by them yet. Another reason is that, according to research, Russians tend to see climate change as an external and remote threat, as opposed to a domestic problem that needs more urgent solutions. In addition, because the climate is changing so gradually compared to the extent of human life, a new and less stable climate is becoming the norm. Climate change may have some niche economic benefits for Russia. Even so, these have to be weighed up against considerable risks, not just from changing weather patterns, but also from the risk of being left at the fossil fuel party when everyone else has left. The world is changing, not just physically, but economically in response to climate change. The world is changing, not just physically, but economically in response to climate change. Russia’s current biggest buyers of oil and gas (over half by export volume) are members of the EU. As European countries seek to lower their fossil fuel consumption, such as through Germany’s Energiewende (‘Energy Transition’), Russia’s traditional markets will shrink. The current government is thus trying to be strategic about capturing a larger share of the international energy market. This is illustrated by President Putin’s ongoing meetings with China, Turkey, and India about supplying them with Russia’s oil and gas in the medium to long term. Yet, the government is still surprisingly shortsighted about climate change. Pipelines to China and (if both technology and political stability allow) a pipeline to India over the Himalayas or through Afghanistan, could be a solution to the dwindling Western demand for Russia’s oil and gas. However, if countries act to avoid dangerous climate change, an estimated three quarters of fossil fuel reserves have to stay in the ground. In the past, falling oil or gas prices led to increased demand that pushed the price for these fuels back up. But in a world where governments intervene with carbon prices or energy efficiency regulations to limit fossil fuel burning, things might be different. Moreover, China is building a diversified import base for its oil and gas, so that Russia will be competing on price with producers in Central Asia, the Middle East, Africa, Myanmar, and Australia. If oil and gas remain around half of Russia’s budget revenue, this is a big risk. Periods of falling oil prices show how vulnerable the economy is, when it puts all its eggs in one basket. We do not need to look far into the past to see the implications for governments and wider society of not heading off risks, and failing to adapt to a changing world. A pattern of abrupt, chaotic change instead of gradual adaptation was a prominent characteristic of Russian society through the twentieth century. If we go back to 1917 we can find an example of how ignoring changes around and within a country leads to social upheaval. The Romanovs maintained power for three centuries, and built the mighty Russian Empire, but they failed to bring in reforms to society, agriculture, and politics needed to make the transition into a successful modern state. The Great War and the Russian Civil War tested the Tsarist system to destruction, and it was overwhelmed by the changes going on around it. More recently, at the end of the Soviet Union, a similar abrupt change occurred, caused in part by unsustainable practices. While there are many factors that explain the collapse of the Soviet Union in 1991, two of the most important lessons are about bread and fuel. Throughout the 20th century, agricultural improvements across the USSR failed to keep up with the rest of the world, meaning that instead of exporting grain, large volumes started being imported from the USA in the 1970s. The USSR compensated by becoming the world’s biggest oil exporter by 1981, but when the oil price fell sharply in 1986 it found itself in a major economic crisis. Again, with climate change we can see risks to both agriculture and fuel exports. The question is whether Russia can be more resilient this time; whether the country will adapt to global changes – climatic, economic, social – or brush them aside until they are impossible to ignore. 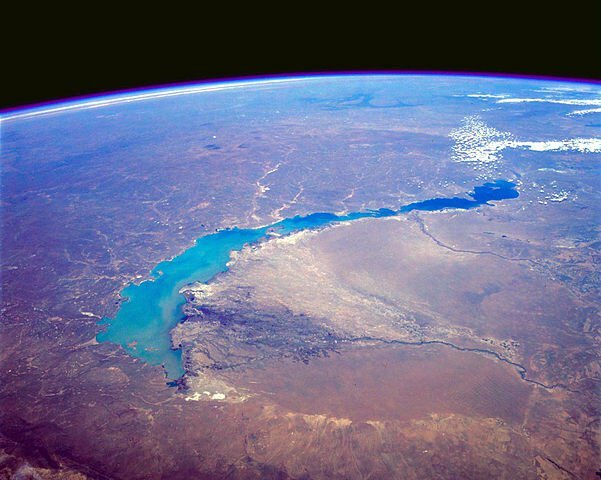 Standfirst image: A view of Lake Balkhash in Kazakhstan. NASA via Wikipedia. All rights reserved.